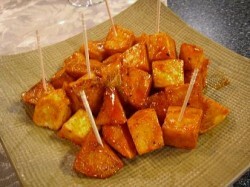 Patatas bravas is the queen of tapas all over Spain and also in Barcelona. There is no bar, from the outskirts to the high class barrios of the Catalan capital, that does not include this dish in its tapas menu. Having said that, only a small number of bars and restaurants have deserved a hand clap from guide books and food critics for the way they prepare this simple and beloved delicacy. And they are not all modern or starring famous chefs. On the contrary, many of them are family restaurants with just a lot of experience in frying right and making sauces that are just that bit better (and stronger and smoother and spicier) than the bar on the other side of the road…Let’s get to know three of these distinguished patatas bravas makers in our headquarters, la Barceloneta. Situated close to the beach apartments in Barcelona, Jai-Ca make them smaller than the standard cut, good and crunchy and served with mayonnaise and a salsa brava that verges a little bit towards ketchup for the safety of the most sensitive tongues. Still, they are unmissable together with 4, 5 or 6 other little dishes. Yes, because once you get to Jai-Ca, you are there to stay. It’s hard to get a table or a nice stool spot at the bar, but once in you’ll be likely to indulge for hours. The huge selection of fish tapas and the unique ambiance make this bar a favorite among locals (of all ages, including retired fishermen) and visitors, therefore you’ll have to be patient. And if you can get the sweet terrace on the sidewalk, congratulations! We never made it! Recently renovated, this bar shifted from a merry tavern for local PhD students to a merry tavern for local PhD students with a little bit more design. The long wooden tables that fostered friendship have been replaced by small, stylish ones, but they didn’t corrupt the welcoming spirit and the food quality has even improved. At Bitácora they take special care with the sauces. They serve the bravas with a dark and tasty salsa made from a tomato soffritto and a homemade mayo and the potatoes are sliced and flavored with herbs. Perfect to accompany other must haves there: asparagus tempura and boquerones (fresh anchovies) en vinagre. Enjoy the vinegar nuances in these three dishes at its fullest! A strong point of this bar is the back terrace, a cozy patio in the shade for a perfect, laid back tapa time with a couple of friends. As the name says, the special tapa here is the “bomb,” a jumbo croqueta with meat and besciamelle often served with the same hot sauce used for the bravas, so take note! But the patatas bravas are good too, with a smooth alioli and a vigorous spicy sauce. La Bombeta is a restaurant located very close to the Passeig Joan de Borbó (the marina). That means that in summer it’s not infrequent to have to line up to get seated. For easier access to these unmissable tapas treats, many of Apartment Barcelona´s sea view apartments in Barcelona are only a short walk from La Bombeta. Want to make patatas bravas at home? Enjoy this rich and simple tapa at home! All you have to do is chop medium sized potatoes into irregular cubes and throw them into salty boiling water for a few minutes. This process will help create the famous crunchy/tender texture. Let them dry on a clean cloth then deep fry them in olive oil until they’re golden. Serve them on a dish and gently pour mayonnaise or alioli (garlic mayonnaise) and salsa brava, which is a sauce based on tomato sauce, vinegar and chili peppers. You can find it in grocery stores and supermarkets, but you can easily substitute it with spicy Mexican sauces. Do not “mix” the sauces; let them blend alone bite after bite until they reach the perfect combination. This entry was posted in Home, Restaurants & Food and tagged best bars in barcelona, great tapas places, patatas bravas, spanish food, tapas. Bookmark the permalink.